Designed as a very relaxing, informative and delicious way for clients to experience the wonder of Miele Cooking Appliances the event was held in Miele’s flagship London Cavendish Place Showroom, with the wonderful Chef, Sven-Hansson Britt, a former runner up in Masterchef, The Professionals. 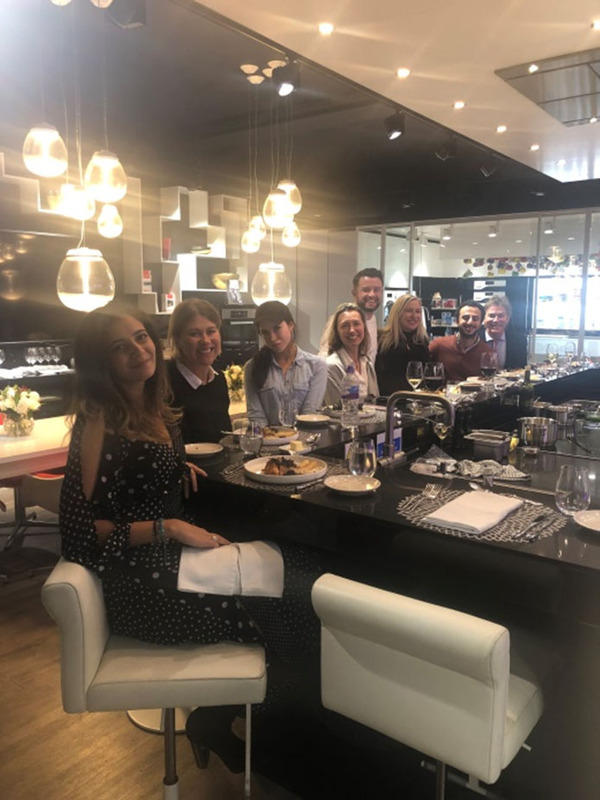 The evening started with my lovely clients arriving and enjoying a glass of Champagne, whilst having the opportunity to look around the showroom and ask Cem from Miele questions about the appliances. We were then sat at the bar area on the island, so that we could observe Sven cooking our 3 course meal. Sven chose to use delicious, local (mostly from Derbyshire, where Sven is in the process of setting up his restaurant), seasonal ingredients – the most unusual of which was salsify, a strange looking vegetable that has the appearance of a twig, but when peeled and cooked in a Sous Vide vacuum bag, tasted utterly delicious! Whilst Sven worked his magic, we were treated to the most light and fluffy Milk Bread, that was cooked in the Miele Dialog Oven (about to be launched in the UK). This oven is almost like science fiction and can cook a piece of fish within a block of ice without the ice melting, and also cook a whole plate of food – meat, potatoes, vegetables etc… and recognise how each individual item needs to be cooked on a molecular level. One of my clients remarked that it was the best bread they had ever tasted! The vegetarian option was excellent as well, with a pan fried cauliflower which had started off the cooking process in the Sous Vide – I was almost jealous as it looked utterly divine! 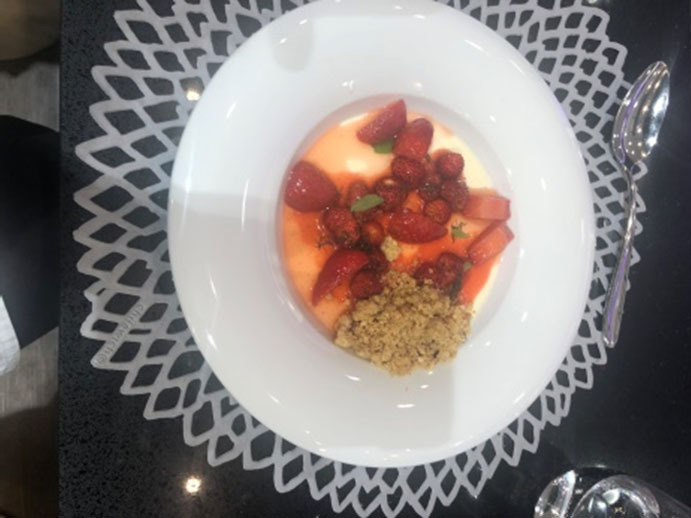 The absolute star of the show was the pudding, with strawberries that had massaged within the vacuum bag to create a strawberry puree, mixed with strawberries and tiny little wild strawberries and cream. 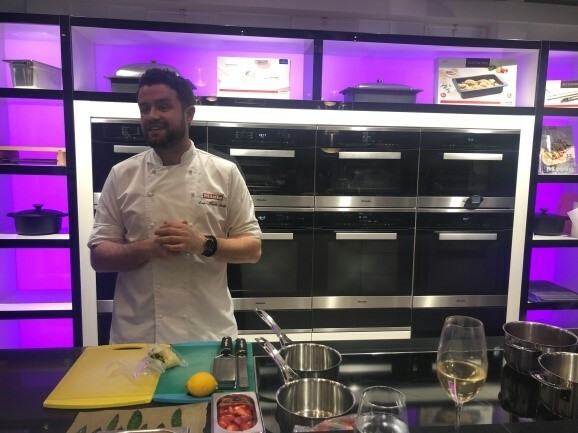 We had a brilliant group of people, who absolutely engaged with the demonstration and asked Sven lots of questions regarding the recipes and technologies within the appliances behind the different processes. The evening was a huge success, and showed how having restaurant quality appliances within the home kitchen, can produce the most exceptional food, and certainly, my clients left considering how they might include things like sous vide within their own upcoming kitchen projects with McCarron & Co.
A huge thank you to Sven, Cem and the whole Miele team for looking after us so well! Our luxury furniture showrooms in London and Wiltshire display a variety of Miele appliances within our bespoke furniture displays so if you would like to arrange an appointment to meet with Naomi or our other designers then please call and we can arrange it.